We have found what may be a rare record of the Tillotson construction enterprise as it existed before 1938. Back then, Charles H. Tillotson led the company, which specialized in wooden elevators. After he died in ’38, his sons Reginald and Joe partnered in Tillotson Construction Co., and started to experiment, and then build, with reinforced concrete. This card from July 2, 1936 is penned by Sister Mary Concepta, the older sister of Margaret Irene McDunn Tillotson (my grandmother) and sister-in-law to Reginald. Sr. M. Concepta, born on Sep. 27, 1901, in Emerson, Nebraska, and christened Catherine McDunn, was the second of nine children. (Margaret, born Feb. 9, 1903, was third.) Sr. M. Concepta belonged to the Sisters of the Presentation of the Blessed Virgin Mary, with a motherhouse at Mount Loretto in Dubuque, Iowa. The parents were William McDunn (b. Feb. 4, 1871, Des Moines, Iowa) and Bridget Loretta Dorcey McDunn (b. March 27, 1872, Luken or Lucan, Ontario). Records show William as a laborer in Omaha in 1891. He became a conductor on the Nebraska Division of the Chicago, St. Paul, Minneapolis & Omaha Railway, and the family became established in Emerson, the town named for Ralph Waldo Emerson, which had come into being in 1881 at a junction on the CSPM&O (known as the Omaha Road). The family history comes from These U.S. McDunns: Family Tree of Patrick McDunn and Mary O’Donnell, compiled by John McDunn, of Lodi Wisc., in April 1989. 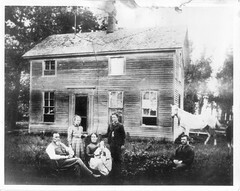 The McDunns homesteaded in Pennsylvania in 1835. My Uncle, Charles J. Tillotson, whose name appears in many of this blog’s posts, had kept his grandfather William’s railroad watch–a Hamilton, of course–until a burglar struck in the late-1980s. Uncle Charles notes that in the mid-1930s Reginald and Margaret lived with the elder Tillotsons at 624 N. 41st Street. They towed a travel trailer to job sites. In early July of 1936 they would also have towed along Uncle Charles, then 18 months old, and my mother Mary Catherine, who was nearly five months old. On this postcard Sr. M. Concepta addresses her sister Margaret (Mrs. Reginald Oscar Tillotson) at Carlyle, Neb. Carlisle–note the difference in spelling–is an unincorporated town in Fillmore County. “I know the name because Mom used to talk about it,” Uncle Charles says. We presume there was a wooden elevator. Carlisle is an unincorporated community in Fillmore County, about 135 miles southwest of Omaha. It doesn’t appear on our Rand McNally page nor does Google Maps seem to know anything about it. “Dear Margaret + Reginald + babes,” Sr. M. Concepta begins. Mary Tillotson was Reginald’s sister who became important to the family business and also is named in many posts here. It’s hard enough to find a trace of Carlisle, but we would love to know if any remnant of a wooden elevator exists there. This entry was posted in Charles H. Tillotson, Charles J. Tillotson, Joseph H. Tillotson, Mary V. Tillotson, Reginald Oscar Tillotson, Rose A. Tillotson, Their Work, Tillotson Construction Company and tagged agriculture, architecture, Business, construction, family history, Nebraska, road trip, travel. At a much later date, my grandfather William Osborn built a concrete elevator for a private farm. These jobs were done for private owners more often than supposed. While looking at Google satellite imagery over unincorporated Carlisle, I noticed metal grain bins installed at nearby farms. I would not be surprised to find that one of the older farms replaced a wooden elevator with metal bins. Also, since these things were extremely flammable with their grain dust, an old Tillotson job may have perished long ago. Fire is the accepted method for destroying old wooden elevators–you invite the local fire department to help direct the demolition. At any event, few traces are left, aside from an intriguing postcard to a construction minded family in a barely discernible place in Nebraska. Uncle Chuck Tillotson writes: I wanted to compliment you on your latest addition to your blog on Dad’s and Grandpa’s grain elevators. Your investigation of the town of Carlisle was also interesting. As with many a ‘spot in the road’ towns in farm country in the early days, they were founded through necessity as a central point for the surrounding farmers to store and sell their grain. As the farming industry grew, these “coagulation” points were relocated to better service the needs of the expanding farming industry and these little spots in the road just dried up and blew away. Hence, the need for larger and more permanent (concrete) elevator construction. Tillotson Construction Co’s business increased to the point that by 1938, Dad evidently felt comfortable in moving the family from his parents home and trailer houses to an 8-acre fruit farm which was located in the northern rural area of Omaha. This residence is still in the family and is owned today by our brother Michael. The days of Dad having to drag a trailer house and family out to a job site were over. Ironically, Dad’s dream of being a farmer and fruit grower never matured due to his expanding business that prevented him from tending to his acreage, and the orchard also eventually “blew away” like the old wooden elevators. Then, after the war, the ever increasing population and better economic conditions created the demand for more and more farming and storage. This put Dad and Joe in the driver’s seat as they were already in business and were able to expand and fulfill the requirement for more grain elevators. Your blog captures this expansion and growth during these years extremely well and my hope for you is that you will continue to document both the struggles and good fortunes of my Dad and his family as you receive more enlightening input from those that provide it after reading your blog.